JANE SHERRON DE HART is professor emerita of history at the University of California, Santa Barbara. She lives in Santa Barbara, California. "An excellent biography ... in its comprehensiveness, range, and attention to detail, this is a vivid account of a remarkable life." "The first full biography of Ginsburg ... passionate and thorough ... a major event in scholarship on American law." "Magisterial and timely ... engaging ... written in clear language and grounded in historical context." "De Hart succeeds in showing us that the 107th person to be appointed to the Supreme Court is much more than a pop culture icon ... Compelling." "Scholarly, yet accessible ... rewarding and compelling." "An in-depth biography of the Supreme Court justice who has become a pop-culture icon." "Meticulously researched, comprehensive ... Ginsburg's career is skillfully placed within the context of American social and political history ... a sophisticated analysis of the justice's thinking on constitutional change, reproductive rights, gender equality, and affirmative action." "De Hart reminds us in her new scholarly biography: Ginsburg is a true-blue legal icon ... [the book] draws on extensive research ... readable and rewarding." "RBG has lived a helluva life, and everything--from her days as a baton twirler in Brooklyn to her eventual ascension to the highest court in the land--is chronicled in this expansive history." "De Hart dynamically devotes more than 500 pages to the amazing life of Supreme Court Justice Ruth Bader Ginsburg ... Telling anecdotes skillfully illuminate Ginsburg's devotion to her family and her wonderfully supportive late husband, her long-standing friendships with an array of public figures, her love of opera, and her humorous wit. This extensively documented account, incorporating more than 100 pages of chapter notes and a bibliography that cites hundreds of resources, is also quite engaging and very easy to read. Expect high demand." "Laudatory ... De Hart's great strength is her ability to explain Ginsburg's cases and the legal strategies she employed ... an insightful, fascinating, and admiring biography of one of America's most extraordinary jurists." 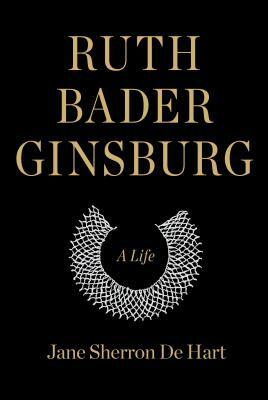 "The first comprehensive biography of Ruth Bader Ginsburg . . . De Hart describes in absorbing detail the behind-the-scenes campaign to obtain her appointment to the Supreme Court engineered by her devoted husband Martin Ginsburg . . . De Hart excels in explaining the majority opinions, and later the dissents, in which she participated with remarkable clarity, illuminating the issues, the competing positions, and the significance of each in language easily grasped by readers with no legal training . . . A monumental biography."